The limited run of 100 instruments which inventor Naoyuki Omo has committed to building has now been depleted. As we prepare what is next from Ondomo, we ask that those who are interested please contact us to be added to our information newsletter. Thank you for your interest and your passion for this instrument - it is a source of inspiration and fuels all the hard work to come. Our small café in Asakusa, Tokyo has now become a complete production factory! As a result the cafe is currently closed to the public, but still functions as a rendezvous spot for those interested in purchasing Ondomo. Width: 64cm - 25 3/16"
Height: 15cm - 5 15/16"
Depth: 17cm - 6 11/16"
Height (with attached legs) lid closed: 77 cm - 30 5/16"
Height (with attached legs and music stand): 104cm - 40 15/16"
With over 16 years of research into what makes the ondes Martenot a singular electronic instrument, this revolutionary compact design from Japan brings accessibility, ease of transport and playability to Maurice Martenot's original vision. With Ondomo you can bring the music with you anytime and anywhere, packing an impressive list of features into a fully contained instrument that's just 64 cm wide (just over 25"). Equipped with a powerful built-in speaker, all you need is a power outlet to instantly connect to the haunting, unmistakeable characteristics of sound that the ondes Martenot is famous for. It is with the goal of sharing this expressive, dynamic electronic instrument that inspired the creator to devote himself to this legacy of love. 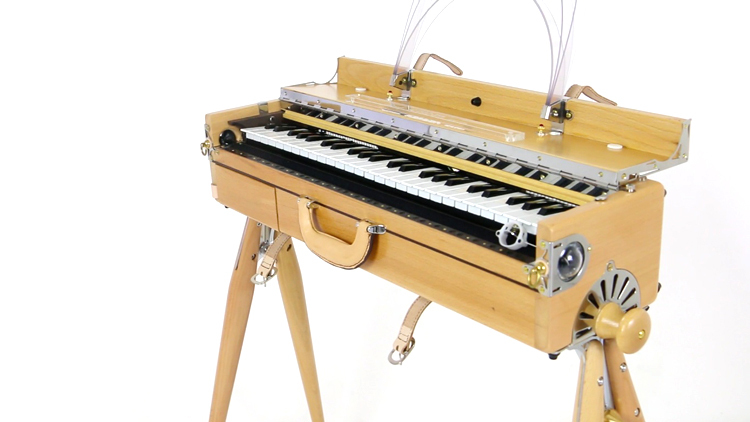 What is an ondes Martenot? 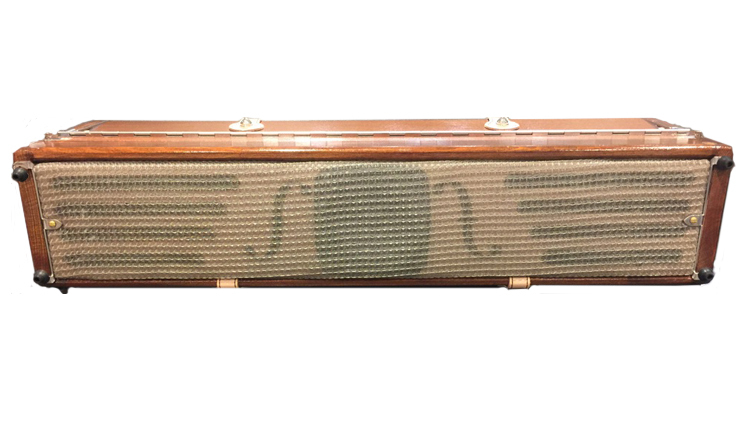 First developed in France in 1928, the ondes Martenot (Martenot's waves) takes its name from the unique, pure electronic tones the instrument produces through the expert manipulation of its sensitive and highly musical controls. There are in the vicinity of 600 pieces of music written for the instrument, all the more reason to keep this rare instrument from slipping into obscurity. To find out more about the ondes Martenot, why not start with this Wikipedia entry or the article at the fantastic 120 Years of Electronic Instruments. 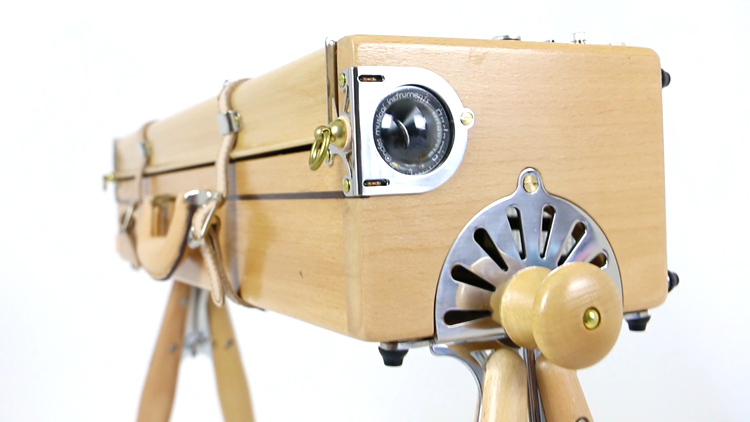 If you have specific questions about the Ondomo or the instrument it is based on, please don't hesitate to contact us - we'd be happy to speak with you about it. Like a stringed instrument wherein the position of the left hand determines the pitch and the right hand the expression and volume of the instrument, the Martenot splits its controls for sound creation between your two hands. The pitch is controlled with the right hand, using either a ring attached to your index finger or the keyboard, and the left hand controls the dynamics and articulation with the touche d'intensité and the timbral controls of the tiroir. Each part of the Ondomo was painstakingly designed to accurately reproduce the highly sensitive elements of the ondes Martenot. From the touche d'intensité, often referred to as the "soul of the instrument", to the keyboard with its unique lateral vibrato. The tiroir is a hybrid of several generations of Martenot's designs, and offers a wide variety of timbral and momentary pitch controls, in addition to the impressive four output mixer. Recreations of Martenot's diffusers / speakers (Palme, métallique, etc.) are on the horizon - we will share any information on these developments as soon as they begin. The Ondomo features a powerful built-in speaker, allowing you to perform without the need to bring additional heavy equipment. Unlike most keyboard instruments, simpling pushing the keys does not produce any sound. The dynamics and articulation are controlled using the sensitive touche d'intensité - a clear, oblong button highly sensitive to even the tiniest pressure. Find out more about the rest of the tiroir's controls in the other links on this page. 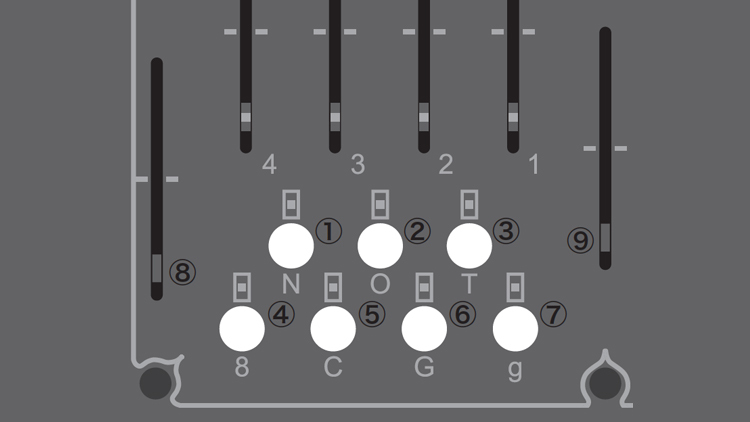 Each button (① - ⑦) on the Tiroir has a different sound waveform, or timbre, assigned to it. Additionally, using different timbres simultaneously allows you to produce a wide variety of sounds with Ondomo. The LED corresponding to each button will light up when activated. ① N - Nasillard Outputs a pulse wave. ② O - Onde Outputs a sine wave. ③ T - Tutti Outputs all waveforms simultaneously. ④ 8 - Octaviant Outputs a sine wave with an added harmonic on the octave. The degree to which the harmonic is present can be adjusted with the slider ⑧. ⑤ C - Creux Outputs a peak-limited triangle wave. ⑥ G - Gambe Outputs a square-wave. ⑦ g - Petit Gambe By adjusting the slider ⑨ to the left of the Touche, your output can sweep through the full range of	waveforms present between the Onde and Gambe. 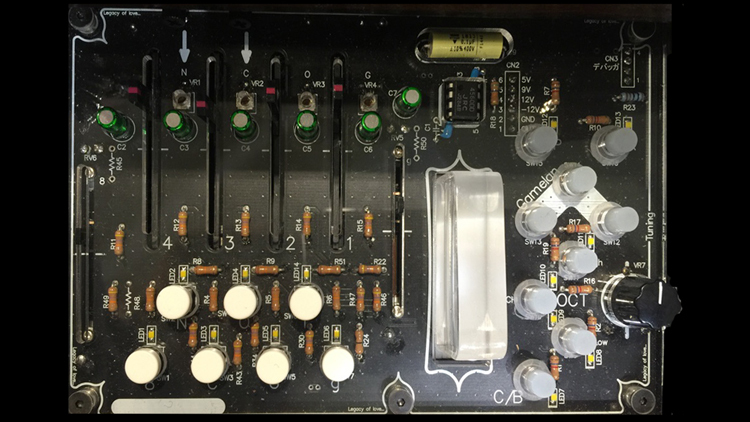 The balance, or mix, of the waveform outputs (① - ④) can be changed by adjusting the volume of the N, C, O, and G timbres individually using a small flat-head screwdriver. Fully turning the volume adjustment clockwise will silence it, and fully turning it counterclockwise will set it to its maximum value. By default, O is maximized, and N, C, and G are set to an equivalent volume. 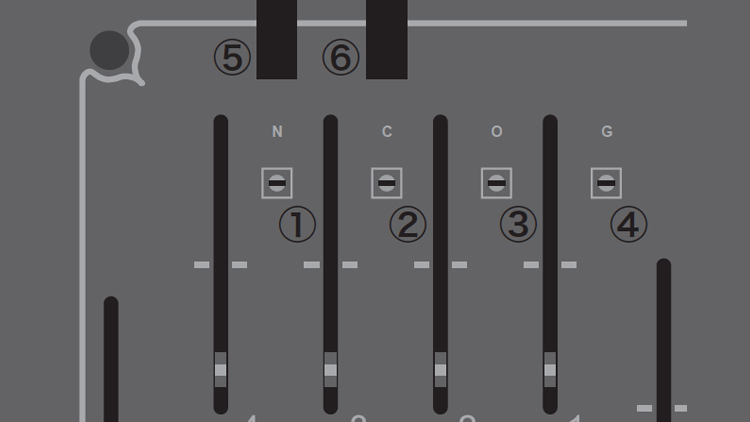 Furthermore, you can fine-tune the following waveforms by adjusting the small knob on the top of the Tiroir’s control panel. ⑤ N This changes the period of the pulse wave. Turning this knob clockwise will result in a more distinctive, nasal tone, but the sound will be more susceptible to cutting-out in the higher frequencies. This is used to control the volume of the sound during performance. It remains silent until pushed and the volume is adjusted with very careful application of pressure. Used for switching between the keyboard and ribbon performance modes. When the LED is lit, the ribbon is enabled, and when unlit, the keyboard. On start-up, the keyboard performance mode is selected by default. Four ranges of octaves can be selected and used: C1 to C5, C2 to C6, C3 to C7 & C4 to C8. The corresponding LEDs will indicate which octave range is selected. The middle button switches between the two middle octave ranges. Used to adjust the tuning of the keyboard. With the reference position at 12 o'clock, it has been adjusted so that A = 442Hz. 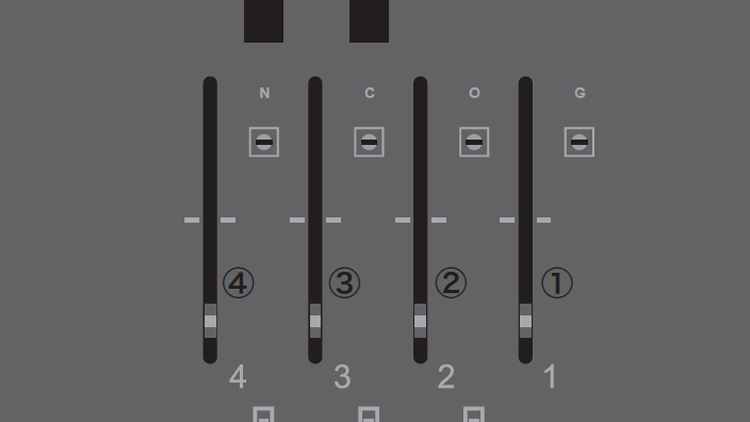 While being pressed, these buttons immediately increase the pitch by adding 2 semitones, 4 semitones, and 7 semitones (from left to right respectively). Each button works independently, and it is possible to increase the pitch by various semitones up to an octave by using them in combination. These buttons work in both keyboard and ribbon performance modes. Changes note priority when two or more keys are played at the same time. 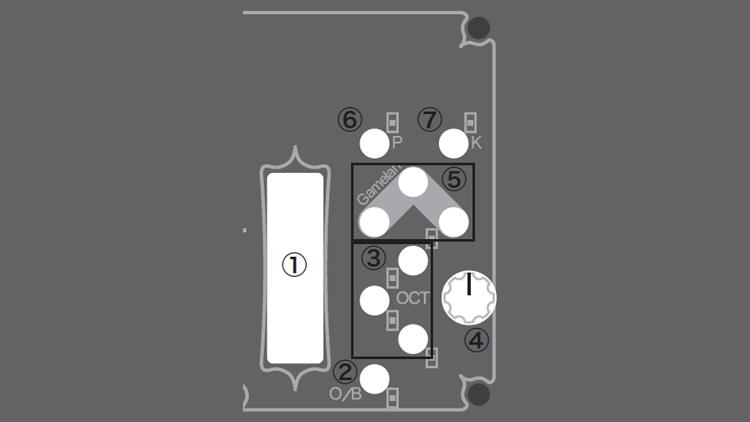 The keyboard has high note priority when the LED is lit, and low note priority when is is not. Selects the “click envelope” mode when using the keyboard. When the LED is lit, playing the keyboard will sound the note immediately, and as soon as the key is released the note will end. It is possible to connect a total of 4 outputs, and by adjusting the use and intensity of each diffuser (speaker) from the Tiroir, you can achieve various ambiances. ① D1 Adjusts the output volume of the main internal speaker. ③ D3 Adjusts the output volume from the right channel of the dedicated ¼” line output on the left side of the Tiroir. ④ D4 Adjusts the output volume from the left channel of the dedicated ¼” line output on the left side of the Tiroir. 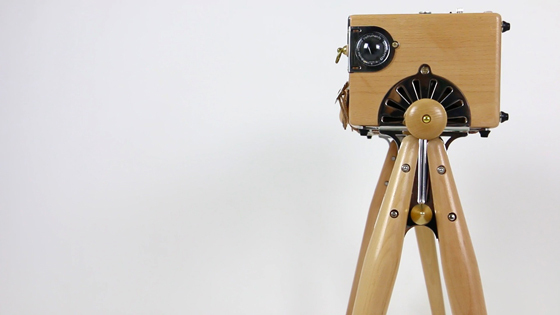 (※) As Ondomo was designed to connect to its own specially-made diffusers, connecting directly to musical instrument amplifiers, etc. may result in damage to the connected equipment. We currently have plans to produce a series of instructional videos aiming at familiarizing Ondomo owners with the use, maintenance, connection methods, etc. of their new analog instrument. Until this process is complete, all sales will continue to be face-to-face, either in Tokyo or during one of our visits to your country. Each of the limited run of 100 instruments is assembled by hand with the utmost care, and the spirit of Martenot's legacy of continually improving his design lives on in our methods. As we expand the Ondomo family in this way, we appreciate your understanding and patience. Development of a complete online ordering process is underway, with an ETA for Spring 2017. In the meantime, to be added to the purchase list, or if you have any questions please send all inquiries to our e-mail below. Copyright © 2017 Ondomo by ASADEN.